It has been a whole season to wait for second generation iPad. While when Apple finally took the wraps off of its long-anticipated tablet, we feel regret to hope so big and expect too much. Anyway, this is still an iPad 2 review and it should be one of the best iPad 2 reviews for ever. Not all like rumor has it, Apple does not expand iPad's original display and still stick with 9.7 inch. While thoroughly re-build structure allows iPad 2 to cut off one-third thickness than the first-generation model, and finally fall to 8.8mm thick. One cannot believe the iPad 2 on hand is thinner than iPhone 4! At just 1.3 pounds, it is lighter than the previous 1.5 pound iPad. And the most concerned issue with drop down of weight is whether iPad 2 is still as stable as iPad last year. And through tests, it is undoubtful that iPad 2 will not get flabby due to 0.2 pound weight lose. Can not understand why Apple this time focus so much on this magnetic trick. What if Xoom or Galaxy Tab make this move faster? Then iPad 2 will not always stand on the top of tablet PC kindom. A simple Smart Cover makes iPad 2 perform much better when watching movies, tabbing email, face time chatting, even it's OK to use iPad 2 as a calendar. Whatever, we can not count in Smart Cover as one of improvements upgraded from iPad 1 to next. iPad 2 is faster, that's true! Dual Powerful Cores in one A5 chip mean iPad 2 is two times faster then predecessors, not only iPad the first, but also other tablet PC followers. You'll notice the difference when you're surfing the web, watching movies, making FaceTime video calls, gaming, and going from app to app to app. Multitasking is smoother, apps load faster, and everything just works better. And this time, we are not glad to include this speed-up exclusively into iPad's upgrade. Since we have witnessed this technology is already employed by Macbook Pro and Macbook Air. Now is 1080p Full HD Movie on iPad 2? Unfortunately neither 1080p nor iPhone 4's Retina Display come true on iPad 2. The most anticipated iPad 2 is one device which could have a 2048-by-1536-pixel resolution, quadruple that of the current iPad. So there is no need to await playing 1080p full HD Blu-ray movie on the iPad 2. While, let's get back to learn old 9.7 inches LED backlighting display. iPad 2 just makes everything you see remarkably crisp, vivid, and bright. Even in places with low light, like an airplane. And there's no wrong way to hold iPad. It's designed to show off everything in portrait and landscape, so with every turn (even upside down), the display adjusts to fit. Take playing DVD movie on iPad 2 as example, (surely you need to learn how to transfer DVD to iPad 2 first ), iPad 2 supports up to 720p H.264 video, which is 4 times more clear than DVD resolution. Now you understand that iPad 2 is still one of the sharpest weapons to kill your time during around 10 hours trip. When you watch YouTube video on iPad through YouTube app, there are tons of protential problems. Such as network connection, Flash Player unsupported, etc. Here is one semplice software that can help you play and watch YouTube on iPad easy and smooth. While this is simply one of the most commenly troubles you will have with iPad 2. 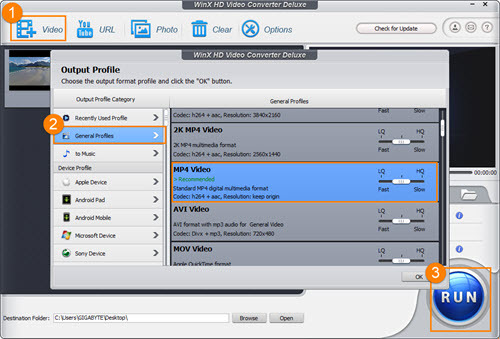 WinX HD Video Converter Deluxe is one application working on Windows PC (Get Mac ver.) Below is a brief list which may updates your iPad from second to third generation faster than others. 1. Resize your Blu-ray movie to fit the iPad 2's resolution. And through transcoding BDAV M2TS video to iPad MPEG-4 H.264 / AVC video, you can shrink 25GB Bluray movie to 4GB or less. It is the only iPad 2 app which never compromiss to quality and file size. 2. Transfer AVCHD camcorder video to iPad 2. It is not a waste for the native iPad 2's HD recording. No matter how high iPad 2's resolution is, tablet PC is not a camcorder. 3. As you see above, WinX allows you download and convert YouTube videos onto iPad 2. One-click solution while greatly enlarges the entertainment especially when the network is dead and it is only iPad 2 with you. 4. Make all your videos playable on iPad 2. This is what WinX HD Video Converter Deluxe made for. Built in more than 400 codec, it generously eat up all the popular videos. 5. The luck also spreads to your iPhone, iPod touch, majority of smart phones and teblet PCs.